If there’s one piece that belongs in every fashion girl’s wardrobe this season (and next), it’s a pair of chic and comfortable sneakers, which is why Matchesfashion.com has recently launched its new Sneaker Studio. Featuring a collective of exclusive sneaker styles across womenswear from brands such as Acne Studios, Chloe, Fendi, Jil Sander, Vetements, By Walid, Peterson Stoop and Alexander McQueen, the collection is available to shop online now and has been celebrated with an installation at Matchesfashion.com’s London townhouse 5 Carlos Place. 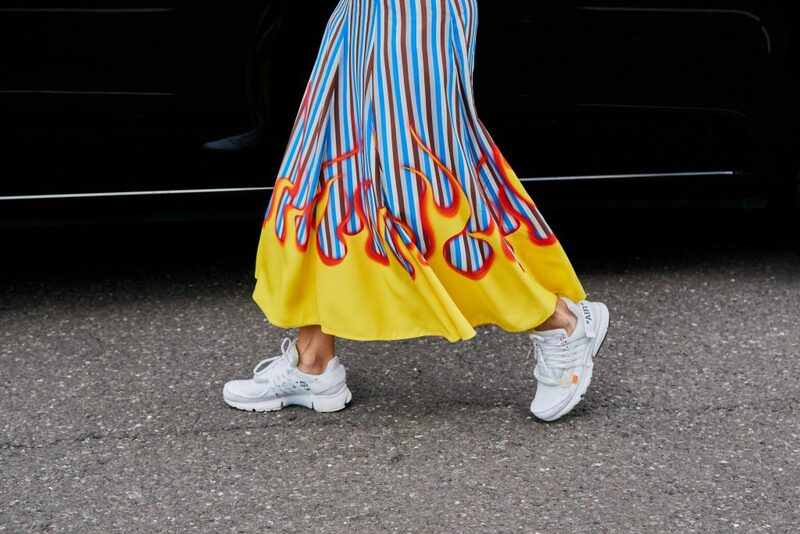 To ensure you’re rocking your sneakers in style this season, here’s six chic ways to wear them according to the street style set. Finish off a trench coat and dark frayed jeans with a pair of white, retro-inspired sneakers. Team an oversized sweater dress with a pair of colour coordinating sneakers for a sporty-inspired look. Contrast a statement making print with a pair of chunky white sneakers. Go for the ultimate high-low look with a party-friendly dress styled with a pair of embellished trainers. Balance out an overly feminine maxi dress with a pair of high top sneakers. For a sophisticated spin, style your sneakers with office-friendly pieces like an oversized blazer.